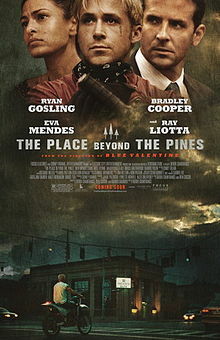 The Place Beyond the Pines is an incredibly ambitious project that tackles many different themes and storylines in its near 2 1/2 hour running time. It is a crime drama that focuses on two separate families, brought together by one earth-shattering event. The film is split into three very distinct acts, each one focusing primarily on one or two characters. Act one most closely resembles a thriller, and it puts the spotlight on Luke Glanton (Ryan Gosling), a motorcycle stuntman with a traveling gig at local state fairs. While in the town of Altamont in upstate New York, he meets up with an ex-lover, Romina (Eva Mendes), who promptly tells him that he has a one-year-old son. Floored by this news, Luke immediately quits his job so he can stay in town and help raise his child. Unsurprisingly, there aren’t too many decent-paying options for a heavily-tattooed and undereducated worker, so he begins exploring other options. It doesn’t take long for him to settle on a life of crime — more specifically, robbing banks. Luke has the mindset that getting a bunch of money will allow him to win Romina back and have a traditional American family. If only it were that easy. 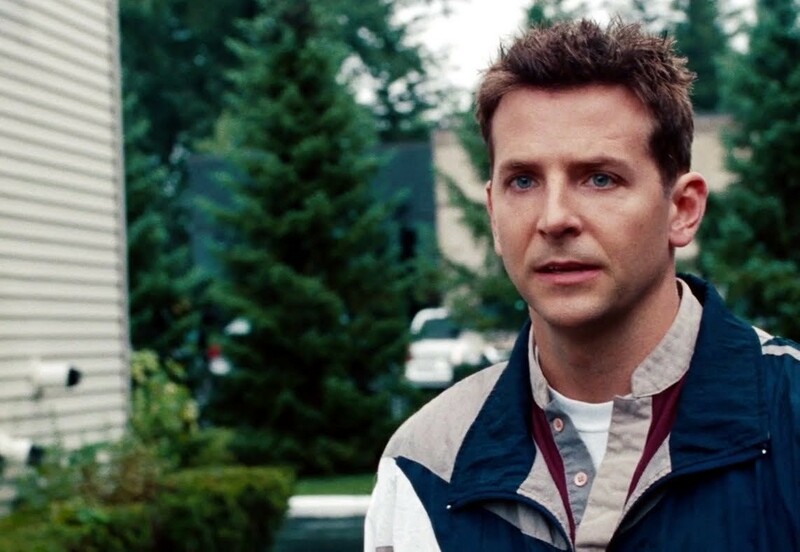 Act two focuses on Avery Cross (Bradley Cooper), a rookie police officer who has his own set of problems. He is struggling to cope with an incident on the job, and he’s also quickly finding out just how hard it is to be a “good cop” in a department already embroiled in corruption. The third act is quite different in tone, and it is set some fifteen years ahead. This act introduces us to the sons of Glanton and Cross (played by Dane DeHaan and Emory Cohen, respectively), as their lives become intertwined. There is a lot of teenage angst at hand here, but also some rather intriguing self discovery. It is impossible to go into too much detail without giving away crucial plot elements, but the way the stories are connected is fantastic. We are given plenty of time with every major character in the film, and even though they all make their share of boneheaded decisions, it’s still easy to become attached to them. This is a testament to both the writing and the cast. Ryan Gosling’s Glanton is almost an evolution of the Driver character from Drive, and his mannerisms and reactions are perfect while performing his daring heists. Bradley Cooper does a serviceable job as the bright-eyed newbie cop, but perhaps the best performance of all comes from young Dane DeHaan. Best known for his work in the HBO show In Treatment or the 2012 film Chronicle, DeHaan is startlingly effective here, and he is continuing to show he has a bright future in the business. The supporting cast is terrific as well, with Ray Liotta, Bruce Greenwood and Rose Byrne all playing small but critical roles. The Place Beyond the Pines suffers slightly from the transition of a thrilling opening act into a more straightforward drama, but it’s still a highly entertaining film overall. The lengthy running time is not an issue, and not once did I grow bored; how could I, with its constantly shifting narrative? Director Derek Cianfrance deserves major credit for bringing such a wide encompassing picture to fruition. Most of it is good, but when it’s bad; it’s obvious and sticks out like a sore thumb. Last act, I’m looking at you. Good review Eric. I didn’t think the final act was bad at all, though I can see how it would bother some. Glad you enjoyed the rest of the film at least, Dan. Nice review Eric. Heard very mixed things about this but I’m still very intrigued to check it out. Thanks man. I think this is definitely worth a look. Probably my favorite film so far this year. One of the best of the year so far, though admittedly, its been a kind of a week year. 😦 DeHaan definitely is awesome, he’s an actor to watch out for, there’s no doubt about it. Glad you enjoyed this one too E! I hear ya, man. Kind of a bummer of a year so far, but this one should still stand out by the end of it. Cianfrance is one to keep an eye on, too. However I had problem with whole Ray Liotta plot. It doesn’t bring the film down in any way, at least not in my opinion, but after the third act, it seemed completely unnecessary. He could have cut that whole plot and we wouldn’t have missed a beat. That’s a problem. Hmm, I can see where you’re coming from on that. But then again, Cooper’s character wouldn’t have ended up in the position he did if it weren’t for the subplot involving Liotta and the other cops. That corruption helped develop him into who he was. Loved the film, and enjoyed your review, quite difficult to do without giving away any spoilers!! Thank you! Glad to hear you enjoyed this one as well. Haven’t seen it somehow. I think I saw a few not so positive reviews and ended up letting it roll by. There’s still a chance to see it in the theater and I just might. I’m glad DeHaan got a nod from you. I thought his under appreciated work in Chronicle was some of the best the film had to offer. Great review Eric. Succinct as always. Thank you for the very kind words, Niels. I think this one is definitely worth a look if it’s still playing; if not, it will make for a great rental. Can’t wait to see where DeHaan goes from here. Nice review, we gave this one the full 3 guys treatment a bit ago. We all enjoyed it. Great performances by Cooper and Gosling. My only complaint was that it seemed like some of could have been left on the cutting room floor to reduce the run time and although I enjoyed the third act, it was the weakest of the three. Thanks, Griff. I agree the third act was the weakest of the three, but I really liked how it all tied together. Glad to hear you enjoyed it all the same! I agree impossible to go into too much detail without giving away crucial plot elements. I love the music that was used in the trailer. Probably the best film I saw in the cinema in 2013. I found his last film Blue Valentine had terrific individual scenes, but was overall a bit uneven for pacing. This time I didn’t have that issue, and like you, I was never bored during Pines. Awesome, sounds like we are pretty much in agreement here! I had a similar reaction to Blue Valentine, too. I thought it was very good, but it felt like it was missing something. Really curious to see what Cianfrance does next. I’ll watch any Gosling film, even Gangster Squad. Very talented actor indeed!! I’m still up in the air on seeing Gangster Squad, but yeah, I’ll probably end up renting it for Gosling and the rest of the cast. Have you seen Half Nelson? That might be my favorite performance from him (aside from Drive). I loved Blue Valentine and I’ve been anticipating this movie since it was announced. So far probably my favorite of the year. I’m right there with you. Best film I have seen so far this year. There’s been an I retesting assortment of opinions on this one. It’s not all that high on my “to see” list but I will see it eventually! I think you’ll dig this one, Keith. I know it surpassed my expectations. I was so surprised at the route this movie took. Admittedly, I originally went to see it because of Ryan Gosling, but damn, the story was amazing and I loved the development of Cooper’s character. And when DeHaan’s character took him into the woods…OMG! Such a good scene. Definitely cried during that one. I know exactly what you mean. All I knew going into the film was that it had three very distinct acts, but still, the transition between them took me by surprise. It’s a testament to the film that it was able to maintain interest even with such big changes in tone. Haven’t seen Ghost Rider so I can’t compare. But this one is definitely worth a look when you get a chance! Hah, kind of funny how that worked out then. Sounds like I’m not missing much by skipping Ghost Rider then? Nice review. Sadly, I was very disappointed in this film. The film starts off with an exciting and unpredictable story that moves into a police corruption scandal that we’ve seen so many times before. The story is quickly running out of steam as everything gets less exciting and turns into a cliché of better films. I can appreciate the cinematography and music though. We’ll have to agree to disagree here. 🙂 I get where you’re coming from though — there’s no way the film could keep up with the frantic pace from the opening act. I thought the other two stories were still quite interesting. Nice Eric. Very Nice indeed. Such a great movie. I found that the third segment stretched credulity a bit but it’s a damn fine piece of cinema. Thanks man. I agree that the third act was the weakest of the three, but you’re right in that it was damn good overall. Great film.